It is really easy to think of people on the internet as just… text generators. You can’t hear their voice, see their face, know their smiles or look into their eyes as you talk to them. Often on the internet I have seen horrendous things said and done to other people, which I only came to understand when I realized that the humanity of the people on the other side of the wire has been lost – and the antagonist has not been able to comprehend that they are talking to a living person, and not just a page full of text or a mindless drone character in a computer game. However, the people I have come across so far in the typosphere have been very different. The humanity and personality of the bloggers I enthusiastically read daily is often soaked into their pages. These are real people who are not hiding behind a constructed online facade, and the typosphere has given them the capacity to be able to engage with each other with great passion and love. I feel, that of all the online communities I have engaged with, the typosphere has been the most unique and rewarding. So with that said, I have a few thank-yous that I want to give to some of people I’ve not yet met, and one that I have. Many of us on the typosphere have been more than willing to go out of our way to help others repair their machines. I’ve sent parts out to people, and given whatever advice and ideas that I can. Meanwhile, others have done the same for me. And most of these people have done so with capricious generosity. In the last couple of months I have received a few packages that have allowed me to get some great machines back to life. While I always like the challenge of improvising a repair, often the easiest and most graceful way to fix a machine is to simply find a part from a spare part. Bills blog can be found HERE. Bill recently posted to a collective of parts which I have been able to use to complete and repair a Corona 3. 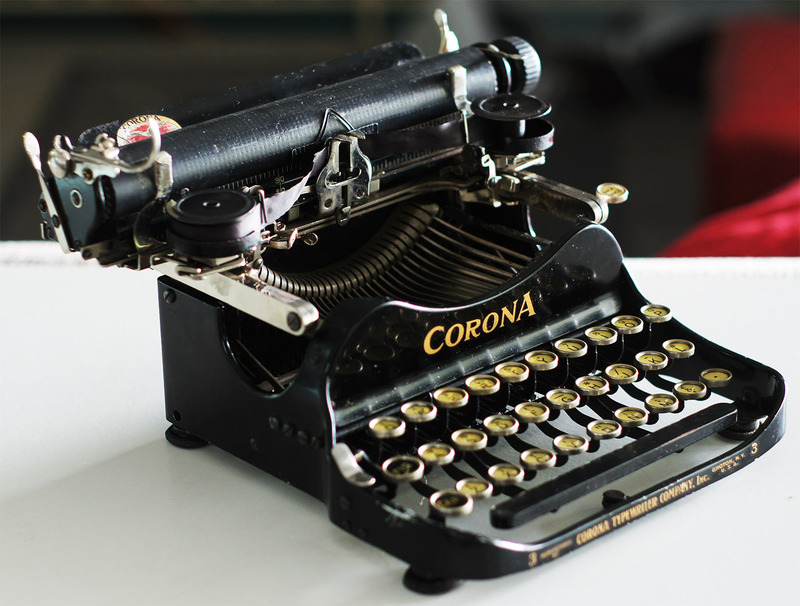 I had originally purchased the Corona 3 as a non working machine off Joseph O’Neil over at the Typed on paper blog. The machine was incomplete, non-functioning but in quite beautiful condition. Bill didn’t ask for any money to post the parts to Australia, which was very generous of him. and I am very thankful for him doing so. As far as I know, Barry doesn’t have a blog, but I came across Barry on the Yahoo Portable Typewriters Forum. After I came back from my last visit to John’s workshop, I put out a call on the forum for a detent roller for an Olympia SM3/Monica etc. I honestly didn’t expect anyone to have one to spare, and I started to plan an improvised substitute. But within hours of my posting the request, Barry contacted me to tell me that he had one that he could offer. Like Bill, Barry didn’t want any money for the postage. Within about two weeks a envelope arrived from the UK that contained the detent roller, and I had it bolted into the machine within minutes of me getting the parcel upstairs. It is an Olympia Monica that is an ongoing project of mine, and I was super-excited to have this machine working. So thank you Barry! 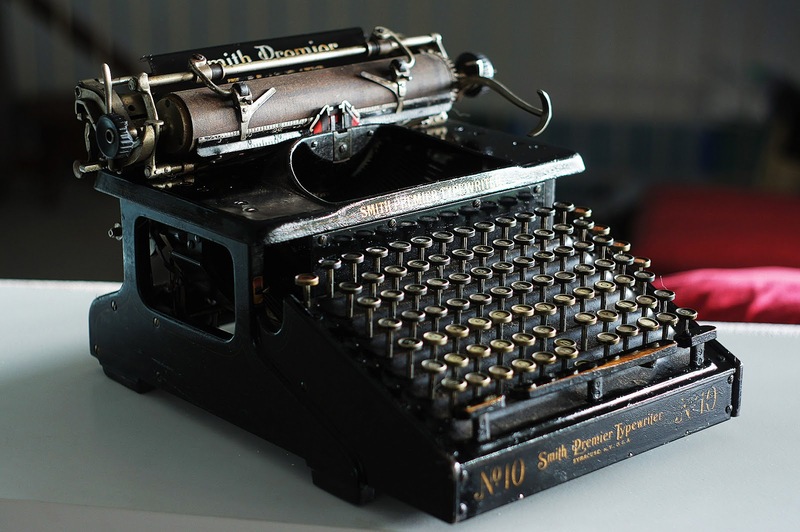 Olympia Monica – based on the SM3. The famous Robert Messenger has been very generous to me. So far, no money has exchanged hands, and I’m trying to think of ways that I can repay Robert’s generosity. Robert has given me two of my all time favorite machines, and I am very appreciative. Yesterday I had a package arrive from Robert that contained a trove of assorted parts. At the Brisbane type-in, Robert left me with a generous array of machines. Two of these machines were ex Scienceworks museum pieces that were in a very poorly functioning state. Both of these machines had parts missing off them when Robert left them with me. One of them, a Remington 7, he actually had forgotten to bring the paper-table that belonged to it along with him, and promised to post it up at a later stage. In the meantime, Robert acquired a paper-table that belonged to a Smith-Premier 10 – a machine which he had also left me an example of. Robert packed these parts, and an assortment of other pieces – including a denture brush which has been used to clean type slugs, into a box and sent it up to me without asking for any money to cover the parts or the cost of postage. 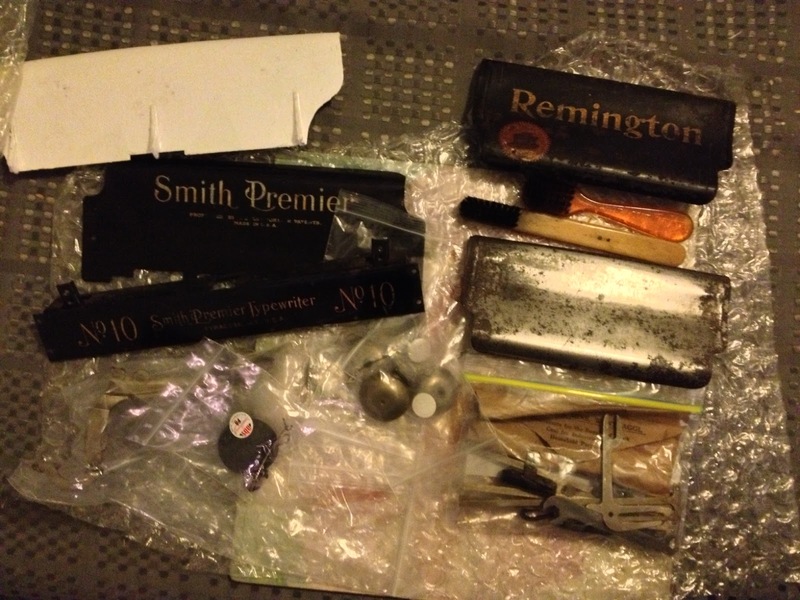 Both the Smith Premier 10A, and the Remington 7 that Robert left me are now complete. However, they are still an ongoing project. The Remington 7 is now in 100% functioning order, and even has new rubber rollers to keep things nicely in line. But there’s still some cleaning and adjusting to be done. Also, no matter what I do, I seem to not be able to complete clear the machine of the hair from Robert’s typewriter guard cat! 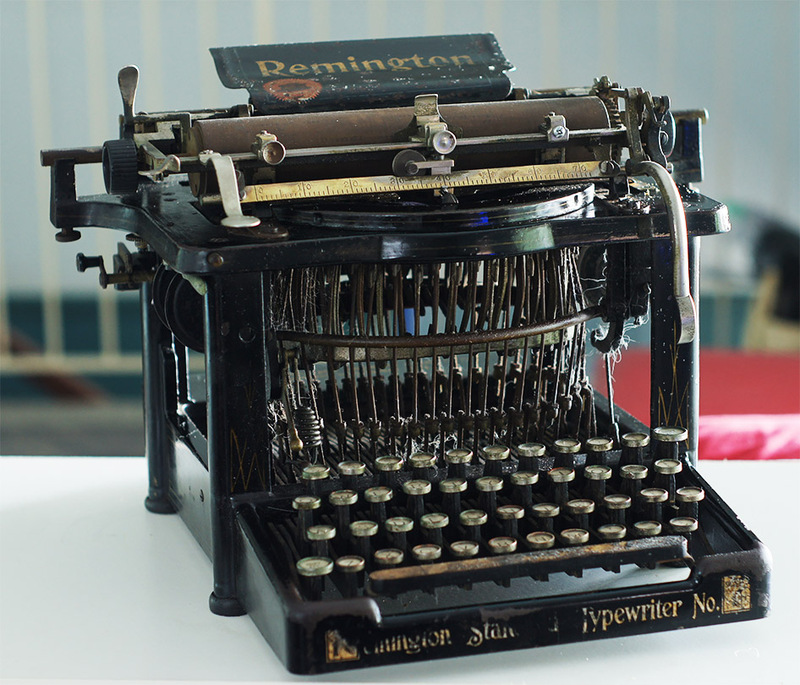 But the Remington is working enough for me to easily be able to write letters on, and use as a demonstration machine. Sorry Scienceworks, you can’t have it back. The Smith-Premier is going to need some serious work. But fundamentally, the machine has a lot of promise. The keys are still filthy with 90 years of gunk in them, but I have cleaned a couple and they came up looking beautiful. For the most part this typewriter works, and with a bit of effort potentially can be brought back to life. It may look as though two keys are missing from the keyboard, but they are just collapsed. There’s a few challenges ahead of me with this Smith-Premier, but it will be an interesting machine to restore. So, thank you very much gentlemen. In time I’m sure I’ll find a way to repay you, but right now I’m very grateful for your generosity. Like you, I send out parts from time to time – without asking for anything in return, and I think it is this kind of thing that makes the typosphere such a great community. And Robert, the denture brush makes an excellent brush for cleaning the wooden type struts on the Remington 7. Very useful! 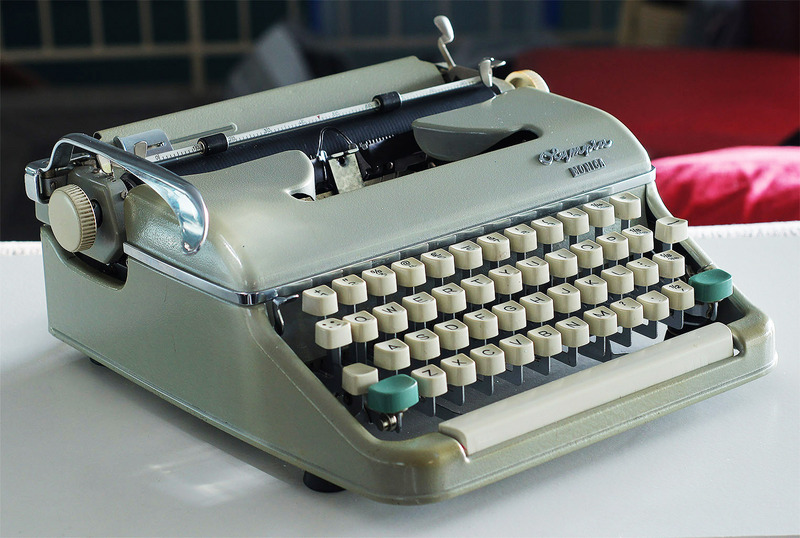 A pleasure to help you, especially when with your care and attention the typewriters look like this! I've only been flirting around the edges of the typosphere a short time but have already felt the community warmth you describe in your post. That's the thing about an interest in common, for them it was fun to help out and see it succeed. You find the same attitude in ham radio. By the way, Charlie sends his regards! Thanks Rob. Wait to see see them when I'm done! Although, I think I have jus lined myself up for a fall. They are indeed great people! I have always been interested in the HAM radio scene. I can understand what you mean. I really should line them up with my Oliver. They are quite a team! Ha ha ha ha. I think…. THINK. That I now have all his fur out. But you never know!